In advance of MISC's The Cities We Need conference on Feb. 19-20, Bonnie Crombie is the Mayor of Mississauga,talked to the Reporter about her life in politics and what she hopes to get out of the conference. Since 1995, the McGill Institute for the Study of Canada (MISC) has hosted a major bilingual conference in Montreal on topics that matter to Canadians and are relevant to current public policy concerns. MISC’s next annual conference, The Cities We Need (Les villes qu’il nous faut) will take place in Montreal on Feb. 19 and 20, 2015, at the Phi Centre (407 St Pierre St). The Reporter is running a series of interviews with guests who will be appearing at the conference in advance of the event. Bonnie Crombie is the Mayor of Mississauga, one of Canada’s largest cities. She recently took over the post from Hazel McCallion, who served as Mayor for a record 36 years. Prior to Crombie’s election as Mayor, she was a Mississauga City Councillor in Ward 5, and before that, she represented Mississauga Streetsville as a federal Member of Parliament. Before entering politics, Mayor Crombie worked in business and public affairs. The Reporter caught up with Mayor Crombie in advance of her appearance at the MISC conference. 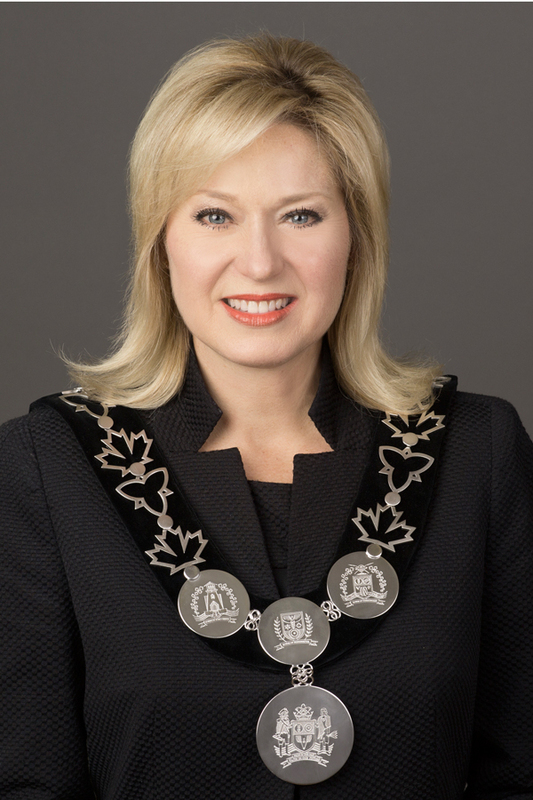 You’ve recently been elected Mayor of Mississauga, following a three-year term as Councillor for Ward 5 – congratulations. How are you adjusting to your new role? From the moment I was elected, I hit the ground running. One of my first acts was to form a transition advisory team made up of leaders from business; charitable groups; and academia, to advise on best practices to implement my platform. I held one-on-one meetings with all 11 members of Mississauga Council to discuss our shared priorities for the next four years, and to explore specific neighbourhood issues. I arranged meetings with municipal leaders including Toronto Mayor John Tory to discuss ways we can shape provincial and federal policies. I have also held discussions with cabinet ministers and met with Ontario Premier Kathleen Wynne. We are holding ongoing discussions about partnering to break gridlock. A leading priority for me is to secure provincial and federal investments for public transit. Mississauga has a plan for a new Light Rail Transit (LRT) system that will connect people from throughout our City. Finally, I am presiding over City of Mississauga 2015 budget deliberations. My goal is to have a financial plan that finds important savings which can be reinvested in public transit, community centres, while safeguarding taxpayers. I have committed to ensuring adjustments to the property tax base are below the rate of inflation. Prior to becoming involved in municipal politics, you spent four years serving as a federal MP on Parliament Hill. How is politics different at the local level? One of the many benefits of serving in local government is that I can participate in a far more exhaustive schedule of community events and meetings because there is no need to travel back and forth from Ottawa. Each day I am at home in my constituency – the City of Mississauga – serving all residents. Another an important benefit about local government in Ontario is that whether you are a councillor or the mayor, you are serving in government. The opposition and government divides of provincial and federal politics simply do not exist in local government. Although, we do have question period during Mississauga Council meetings – these are questions asked by members of the public to their elected officials. It’s a genuine, grassroots, democratic experience. One of the great things about being an MP is having a local constituency office where you can provide frontline service to residents close to their homes. For these reasons, I decided to bring City Hall to the people. Each month I hold one-on-one meetings with Councillors in their wards at community centres, to meet in-person with residents and to discuss their particular issues, ideas and solutions. Mississauga is one of the most highly populated municipalities in Canada, and one of the fastest growing. As Mayor, what are some of the challenges that come with managing such rapid growth? Mississauga is Ontario’s third largest city and Canada’s sixth largest city, and our population continues to grow. We are planning new and important intensified developments, consistent with the planning and growth requirements for Mississauga, in the Ontario government’s Places to Grow Act – legislation that regulates municipal planning. Mississauga’s proposed light rail transit (LRT) plan is a leading initiative that will allow us to responsibly manage population growths. The LRT will connect residents from Port Credit in southern Mississauga, into the Cooksville GO Train Station and the Square One City Centre area. The LRT will reduce traffic gridlock. It will create jobs and generate economic development. It will elevate the quality of life for residents, and perhaps most importantly, it will unleash the potential of our Downtown core. Not only is Mississauga’s population growing but we continue to be a thriving and diversified community. One of my first acts as Mayor was to work with Council to form a Diversity and Advisory Committee so we can break down barriers and develop policy solutions that will foster a more dynamic and inclusive community for all cultures and faiths to be further engaged in. At The Cities We Need conference, you’ll be participating in a panel with fellow Mayors Mark Heyck (Yellowknife, NWT), Dan Mathieson (Stratford, ON), and Mike Savage (Halifax, NS) – who was a colleague of yours when you both served as Members of Parliament. What are some of the things you hope to discuss? I look forward to the opportunity to discuss ways municipal leaders can work together to help shape provincial and national policy debates. For example, all Canadian cities need dedicated and predictable funding to go toward public transit and infrastructure, like roads, bridges and highways. Municipalities also have an important leadership role in helping provincial and federal governments generate economic development. I welcome the opportunity to discuss ways municipalities can collaborate toward attracting job-creating investments. Cities are the engines that drive Canada’s national economy – we need a united voice to ensure these local engines thrive and compete. We all have best practices and we need to make sure the appropriate channels are in place to exchange best practices and ideas. The Federation of Canadian Municipalities and in particular, that organization’s Big City Mayors’ Caucus, are all important outlets to bring municipal leaders together to speak with one, united and strong voice. The discussions and ideas shared during the McGill Institute for Canadian Studies Conference will certainly help shape my own contributions to FCM and other organizations that bring mayors together. You can learn more about the MISC conference and register here. Registration for the two-day conference, including the opening night reception, is $100 for the general public, and $25 for students. The Reporter has been publishing interviews with various speakers from The Cities We Need conference up until the conference starts on Feb. 19. Read the interview with, Dan Mathieson, Mayor of Stratford. Read the interview with Nathalie Simon, Mayor of Châteauguay. Read the interview with Mark Heyck, Mayor of Yellowknife, and McGill alumnus. Read the interview with Andreina Seijas, an urban night researcher looking at what cities in Latin America and the Caribbean can do to promote their night-time economies and to create quality spaces for work and leisure after hours. Read the interview with Will Straw, Director of MISC, on the impetus behind the The Cities We Need (Les villes qu’il nous faut) conference.